The #1 auger of choice by rental centers and contractors worldwide. Once you use a counter-balanced Easy Auger® hydraulic earth dril, you'll never use anything else. Constructed with 1/4" thick steel frame, the Easy Auger® provides up to 350 foot pounds of torque for digging! 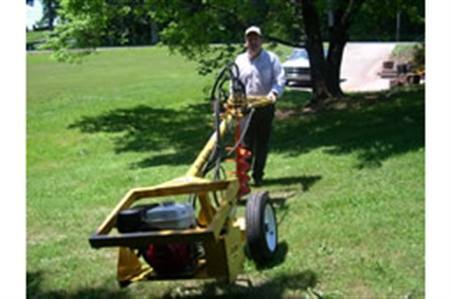 Both the self-propelled and the non self-propelled models feature a patented auger drive with a two-stage hydraulic pump. The two-stage pump allows the auger to gain torque and power through even the toughest of earths! It's like having two gears, working just like overdrive in your car or truck. 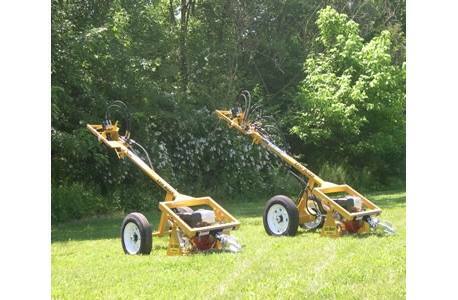 Easy Auger® has a pivoting engine cradle for ease of use and proper tongue weight distribution when towing. The handle swivels to allow for drilling holes on a hill or to angle holes. The tow cradle attaches to the engine cradle by inserting two pins. The self-propelled model requires one of the pins to be taken from the wheel drive so no damage is done to the machine while towing. Augers are available from 2" to 18" in diameter with a variety of teeth, bits, and extensions (up to 66" deep). The augers attach quickly and easily. Each auger comes standard with a 7/8" square hub, dirt teeth, and pilot bit. Adapters are also available to use your existing bits on the Easy Auger®: Stihl (1.125" round), General (1" round or 1.375" hex head), and Little Beaver (1.25" square). We also carry a complete assortment of special duty pilot bits, teeth, extensions, and adapters. Bit Torque (ft. lbs. ): <350 lb. Bits Available: 2 in.- 18 in.